A member of the pea family, the Whitethorn Acacia is long-lived and able to survive only on rainwater in the Albuquerque area. It becomes either a large shrub or small tree. 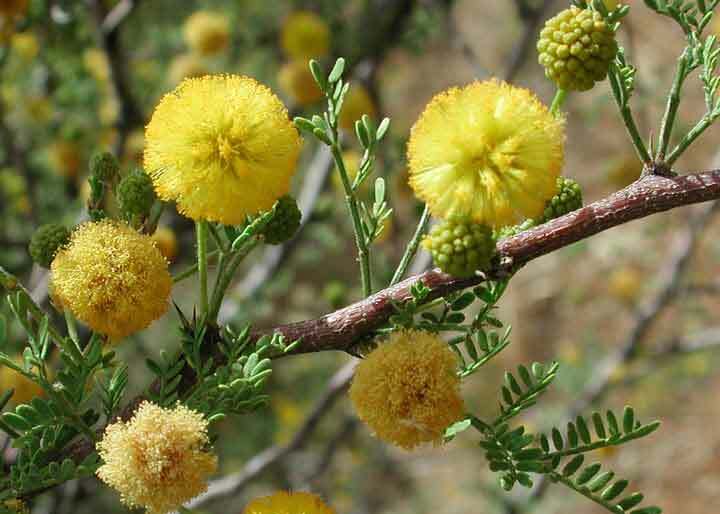 Naturally occurring on rocky slopes and drainage washes from Arizona to Texas at elevations from 1,500 to 6,000 feet, Whitethorn Acacia produces fragrant, yellow puffball flowers from April through June that develop into 2”-5” long capsules with clear constrictions between the beans (thus the Latin name). Branches range from dark grey to reddish-brown, with a distinctive zigzag shape and deciduous, fern-like foliage. Whitethorn Acacia is hardy to -10 degrees. Site this plant with an understanding of mature size, and a realization that pruning will require interaction with numerous slender, white spines. With diligence, it can be pruned into a small tree that casts filtered shade. Well-adapted to life in an arid location, the Whitethorn Acacia will not produce leaves or flowers during drought. It’s a great plant for wildlife, as the flowers attract butterflies and bees and the seed pods are favored by quail. This versatile plant, whether trained as a small tree or allowed to grow naturally as part of a low-maintenance buffer, asks for little and gives much. Select it for any of its numerous positive qualities, including its showy flowers, whimsical form, and excellent drought tolerance.